oday was Dock’s annual Arts Day. While this day of celebrating the arts has changed over the years, many alumni point to this day as one of the most significant days in their four years of high school. Each high school grade prepares music, dance, visual arts, culinary arts, creative writing, and fabric arts as they compete against other grades. After countless practices and an all-day performance schedule, Arts Day culminates in an evening program. This is not traditional education. This year each Middle School student took “Innovation Class.” Students collaborated and developed amazing projects on a given theme (see more starting on page 2). This is not traditional education. In Personal Finance class at the high school campus, students served as financial advisors and met with community members to review their finances and give advice. This is also not traditional education. “We don’t want to hold onto traditional methods simply because that is the way we have always done education. In the Literature of War and Conflict class, students recently spoke with a Living Branches resident about racism and prejudice. Our teacher was impressed with her students’ maturity and ability to engage such a difficult topic. This is not traditional education. The landscape of formal education is rapidly changing. For many years, educators and parents have noted that the shape of education has not changed significantly for well over a century. In traditional education, the teacher possesses the knowledge and facts. The teacher’s primary goal is to transmit that information to the students. Meanwhile, my young granddaughters will likely be hired for a job that doesn’t currently exist. They will have ready access to information and facts. They will likely need to train more frequently for their jobs than was expected for my career path. Authors and consultants have proposed various programs and models for our schools over the years. Project-Based Learning, or PBL, is one phrase that describes many of these programs. Several key ideas run as themes throughout the PBL approach. -	To best prepare our students for the world they will encounter, they need to have skills in critical thinking, problem-solving, collaboration, and communication. -	When a student realizes that learning connects to real life, the level of learning is significantly elevated. Interacting with an authentic audience helps build that connection. -	Teaching students how to get the information they need, while effectively sorting through the massive volume of information available, is paramount in preparing them for life beyond school. -	Finding a student’s passion is critical in the process of tapping into his/her greatest potential for learning and finding direction for future involvement in the world of work and service. At Dock, we strive to be a leader in this movement toward an exciting future in education. We don’t want to hold onto traditional methods simply because that is the way we have always done education. We are a small, nimble school that can move quickly in a positive direction. Our Board and Administration are excited about finding even better ways of engaging our students and inspiring them toward authentic learning. 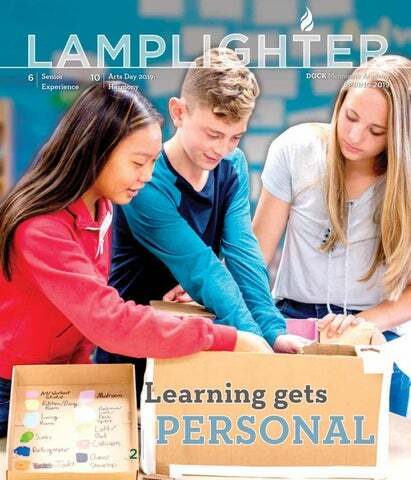 In this issue of Lamplighter, you will read of changes we are already making. In the coming months you will hear more about a new model that we will introduce for our Middle School next year. Learning is truly exciting and inspiring! Eighth graders Emma Celenza (left) and Celeste Derstine make their presentation on a Spanish Immersion experience to the Dock Board of Trustees. The presentation was students’ “passion project”—the culmination of their Middle School Innovation Class. A growing body of research says students are better prepared for college, and for life, when they are invested in hands-on, experiential learning. The trend is already having a significant impact on Dock classrooms. t their January 2019 meeting, Dock’s Board of Trustees received an unusual curriculum proposal for a Spanish Immersion experience at the Early Childhood to Grade 8 Campus. The proposal wasn’t unusual because of the content; the board has great interest in offering such a program. It was unusual because it didn’t come from a teacher or administrator—but from two 8th grade girls, Celeste Derstine and Emma Celenza. “It was impressive that they wanted to present this to the board in the first place, but even more so the confidence they had in what they were presenting. They made a good case,” said Dock Superintendent Dr. Conrad Swartzentruber. “They had a well-organized Powerpoint, but what impressed me more were their answers to some of the questions board members asked. For example, they were able to cite statistics about the percentages of Americans speaking various languages. 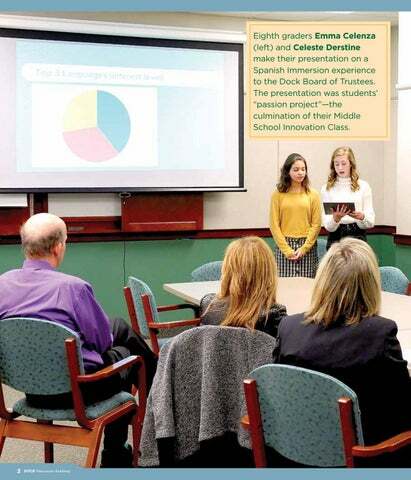 It was clear they had learned a lot more than what they presented.” The desire for deeper learning about Spanish language and culture exhibited by these two middle school students represents some of the firstfruits of a wave of hands-on, experiential learning opportunities across both Dock campuses. Traditional classroom teaching, centered on lecture, discussion and testing, is quickly giving way to curriculum that revolves around student curiosity and passions while teaching life skills such as critical thinking, collaboration, and problem-posing/solving. “There is so much deep learning and skill development that takes place outside the school day. We want to get more of that learning into the classroom—to make the ‘membrane’ between school and the rest of the world more permeable,” said Dr. Sharon Fransen, Dock’s Assistant Superintendent of Curriculum and Instruction. When that happens, student engagement and motivation increases dramatically. “I recently spoke to a Dock alum who is now in college, and he said he was designing his own major,” Dr. Fransen added. “The trend is for students to take more responsibility for their learning, which will make them feel more engaged and empowered to take what they‘re learning and apply it. It’s more personalized education.” Lessons from the Tiny House project The education “buzzword” for this is Project-Based Learning, and it has been the focus of a new Innovation Class for Middle School students at the EC-Grade 8 Campus. The class began with a few small-scale projects to get students’ creativity flowing. For example, one class had to create a marketable product using some basic supplies— paper clips, rubber bands, paper and a few straws. Students came up with everything from wind chimes, to clothes hangers, to a belt purse. In another exercise, students selected one of 10 random items and had to describe a new, alternative use for that item. 1: Innovation Class students learned about the environmental, design and aesthetic aspects of tiny houses, but also sharpened 21st century skills such as collaboration, communication, and creative problem-solving. 2: Innovation Class students designed and built scale models of tiny houses based on feedback from an “authentic audience”—real architects Michael Panachyda and Dock alum Kyle Nice (‘01), who helped build tiny houses for the homeless with Help Make it Rain, a service agency founded by his Dock classmates, Austin and Julie Landes. skills that will help them in virtually every area of their lives later on,” she said. “These students are going to be doing jobs and creating products that haven’t even been thought of yet,” added Mrs. Longacre. “You need to be able to convince someone to invest in your idea, and that requires research and presentation skills. Also, in the classroom, once a research paper is done, it’s done. But in the real world there is often more work necessary to fine-tune a product or project. We’re trying to help students build the stamina for sustained thinking and problem-solving.” 21st century skills Collaboration, communication, creative problem-solving, public speaking—these are 21st century skills, Dr. Fransen said, and they are at the heart of project-based learning and the curriculum changes under way across the Dock school system. Another student learning from the Innovation Class is that research goes well beyond simply looking up a few websites. For their presentation, for example, Ms. Derstine and Ms. Celenza used quite a few of these 21st century skills as they conducted a number of surveys and interviews to help build their case for Spanish Immersion. 3: Principles of project-based learning helped inform Dock’s first-ever Experiential Day in early January, providing students with hands-on, outside-the-classroom learning experiences such as this trip to the National Liberty Museum in Philadelphia. See Campus Happenings (page 18) and visit the Lamplighter Extra page on the Dock website to learn more about Experiential Day. There is nothing like a week “on the job” to give students a feel for the careers they’re interested in. An “up close and personal” look at the challenges a 5th grade teacher faces made Alexis Landis want to be one that much more. For Sydney Cardy, who spent the week backstage at several different Broadway productions—“a dream come true,” she said—Senior Experience was valuable for steering her away from some career choices in the theater field. Alexis Landis Franconia Elementary School It’s been great looking at the different challenges a teacher has to go through, and to see kids learn in different ways—some faster, some slower, some visual, some hands-on. I had fun learning and re-learning things as well. It’s funny because some fifth graders really ARE smarter than you sometimes. I was the most involved today. I got to be the judge of a writing contest and got to grade their tests. Two of the kids hugged me, and at the end of the day, one of the girls said, “I will never forget you, Miss Alexis!” I really just want to go back and finish out the year with them. They have made me want to teach even more. Micah Souder Penn Airways/Heritage Field Shadowing the pilots and mechanics was a lot more fun because it was hands-on work and I was learning useful things for the future. The pilot had to do a preflight check because he was headed to Florida. He had to go over the whole aircraft and make sure everything was working properly. My time at Heritage Field opened my eyes to all the work that goes with my dream career. I hope to keep in contact with them; in fact, I’m thinking about joining their pilot program so that I can get my pilot’s license. ‘Moving mountains’: Service makes a lasting impact, too Elissa Odeh and Aliyyah Haggard did not know what to expect when they signed up for a Mennonite Disaster Service trip to South Carolina to help homeowners there recover from a flood. “I was amazed at the amount of work that goes into cleaning up a house after flood damage,” Haggard said. “I was so glad that we got to meet the homeowner. Hearing his story was sad, but it made my experience so much more meaningful.” “I will never forget the look on the homeowner’s face,” added Odeh. “He was so thankful for what we did. We changed his life and helped him through a difficult time, and that’s when I felt God’s presence.” Getting a taste of a real work environment can impact student’s college and career choices, and perhaps even turn a life in an entirely new direction. But many Dock seniors choose to serve during their Senior Experience— and those choices can also have life-long impacts. Nicole Ford Phoenix Physical Therapy One thing the therapist explained to me was that, toward the end of a patient’s time in therapy, it is important to do exercises that mimic things they would do at work. For example, one patient was recovering from a back injury, and her job consists of lifting boxes, going up ladders, and pushing things around, so he designed exercises to replicate that sort of work. This will allow him to evaluate whether she is ready to go back to work. The main goal of therapy is to get motion and strength back first, then get the patient ready to go back to their everyday life without any issues. Jacob Gordon Bergey’s Automotive, Thompson BMW I liked it so much I want to repeat it over and over. I am just ready to work. I will have a job at an auto dealership eventually. I have lots of knowledge and it can be used at a dealership. I already know my passion; I just need to pursue it. Kate Strickland St. Luke’s Hospital In the hospital I was able to feel satisfaction by helping others and attending to their needs. Though I was only allowed to observe closely, I felt as if I had touched so many lives just with my presence. I felt accomplished on day two when a resident asked me if I wanted to practice intubating a mannequin, which I was able to do on my first attempt. 1: Brooke Bozarth’s week at Doylestown Hospital convinced her that a career as a trauma nurse is the direction she wants to pursue. 2: Micah Souder got a step closer to his dream career in aviation during a week at Penn Airways and Heritage Field in Limerick. A pilot’s license could be next! 3: At Phoenix Physical Therapy, Nicole Ford learned a great deal about the relationship between surgery and physical therapy, and the importance of communication between doctors and therapists. 4: Jacob Gordon didn’t just get to hang out around awesome Corvettes and Camaros at Bergey’s Automotive, he learned about the car business from two Dock alumni who are already employees— Grant Souder (’16) and Maura Shisler (’17). The pleasing arrangement of parts. Balance. Symmetry. 2 1: Ninth grader Laurel Latt played the third movement from Franz Joseph Haydn’s “Sonata in D Major.” Different notes and tempos, she said, “must be perfectly combined to create a piece that is pleasing to the listener.” 2: The senior skit, written by Aya Berry, was a fantastical story based on the Edward Hicks painting, “The Peaceable Kingdom”—which was inspired by the prophet Isaiah’s vision in Isaiah 11:6-8. 3: Senior Kate Strickland’s macramé wall hanging shared a blue first place ribbon with Abby Morgan’s quilt, in which different fabrics, colors, and patterns came together to create something beautifully functional. 4: Students heard four languages—Korean, Chinese, Indonesian, and English—in the song “Way Back Home” performed by Keira Chung (pictured), Songheon Kang, Isabelle Li, and Marciella Shallomita. “Music is the most fascinating thing in the world,” the trio wrote, “because it breaks down language barriers.” 5: Sophomore Isabella Benner’s prize-winning Nutella Raspberry Trifle. Thank you to Sam Williams ’20 for the design of this year’s Arts Day poster. and the MCC Material Resource Center in Harleysville. The Dock community collected over $1,100 in donations, as well as 2,600 pencils, 7,500 band-aids, and 6,500 bags to put them in—and we had fun every step of the way. Visit our web page at www.dock. org/service to see all of the photos from our Service Night— and one very special video! 1: Sharon Swartzentruber (far left), coordinator of the MCC Material Resource Center in Harleysville, helps students knot a quilt. 2: Hundreds of dollars were raised $1 at a time trying to duct tape Mr. Ryan Detweiler and Mrs. Jayne Longacre to the Longacre Gym wall. 3: In addition to a tournament for the badminton “professionals,” Dock’s Service Night also included a session for beginners like kindergarten student Aubrey Jernigan. 4: Students Jessy Guo and Steve Wang claimed the badminton tournament championship. RECORDS FALL ON PI DAY…. Each year on March 14 (3.14….Pi Day) students in Mr. Dana Gehman’s math classes are challenged to memorize Pi to as many decimal places as they can (Pi can be calculated infinitely, and has no pattern). This year, 9th grader ZiJian (Zi) Li was the big Pi Day winner with a new school record of 500 places—smashing the old record of 333 places. Zi is pictured here with his prize, a giant cookie from Giant. Junior Rachel Jin also broke the record with 431 places. Congratulations to both students on their impressive accomplishment! 4 STUDENTS, TEACHERS FACE OFF ON THE CLASSH-ROOM Teams of students and teachers from both of Dock’s campuses competed recently on the popular Fox 29 game show, The ClassH-Room. The ClassH-Room is a triviabased game show for teachers and students in grades 7-12. Each episode features students and teachers from the same school, competing against each other to try to win funds for their chosen charities. The show airs weeknights at 6:30 p.m.
1 1: The High School student team, in green sweatshirts, included (l to r) Louis Cocco, Sydney Leaman, and Nicole Ford. Faculty team members, in gray sweatshirts, included (l to r) Mr. Ron Hertzler, Mrs. Kathy Kennel, and Mrs. Kellena Smith. 2: Middle School Student Council members had fun shopping for items to donate to Keystone Opportunity Center in Souderton. 3: Haley Harper is interviewed by reporter Bruce Gordon for Fox 29’s story on Dock donating its winnings to Keystone Opportunity Center. 4: Dock’s Middle School team included 8th graders (l to r) Haley Harper, Marlyse Giesbrecht, and Simon Hershberger…for the WIN! Middle School students featured in the December 4 episode included (l to r in photo above) Haley Harper, Marlyse Giesbrecht and Simon Hershberger. The faculty team competing against them included Mrs. Kaci Hunsberger, Mrs. Claire Wanamaker, and Director of Marketing Mrs. Kathy Gordon (a pinch-hitter for Mr. Michael George, who was under the weather). The High School student team included Louis Cocco, Nicole Ford, and Sydney Leaman, while the faculty team included Mr. Ron Hertzler, Mrs. Kathy Kennel, and Mrs. Kellena Smith. Dock’s mascot, Christopher the Pioneer, was also in attendance for the taping. As a result of Dock’s participation on Philly Fox 29’s The ClassH-Room, we were able to share our $1,000 winnings from both episodes with two charities, Keystone Opportunity Center and Mennonite Disaster Service. Fox 29 even ran a separate story on our Middle School students shopping for items to donate to KOC. That’s what you call a “win-win”! Visit our website at www.dock.org/thewindow to read the full ClassH-Room story, including photos and links to both episodes and the story about our shopping trip for Keystone Opportunity Center. WINTER CAMP CELEBRATES CHINESE NEW YEAR As part of a partnership with China USA International, Dock hosted 20 Chinese students on our EC to Grade 8 Campus for a Chinese Winter Camp. Dock students and their families joined together with our Chinese students for a special afternoon celebration, enjoying many aspects of Chinese culture. All in attendance had the opportunity to learn to write in Chinese and some even tried their hand at making dumplings. Everyone enjoyed eating dumplings and other delicious Chinese cuisine as part of the celebration of Chinese New Year! READING LIKE A BOSS Students in Mrs. Kelly Kratz’s first grade class enjoyed a reading celebration recently, and the theme was “Boss Day.” Students dressed up to read “like a boss” and even had a “board meeting” to share what they learned from their books. MIDDLE SCHOOL PROJECT FAIR Dock Middle School students displayed the results of some of their learning to family and friends at Dock Project Fair 2019. Projects and demonstrations included 6th grade Tiny House and Social Studies projects, 7th grade Health and Computer Projects, and 8th grade Innovation Arcade, Reading/Writing, CO2 cars, and Phys Ed games. All work showcased at the fair reflected sustained student inquiry, creativity and deep learning. FIFTH GRADERS SKYPE WITH AUTHOR Dock 5th grade teacher Mrs. Kaci Hunsberger hosted a Skype session with her students as they celebrated World Read Aloud Day! Students skyped with author Ellen Potter and were excited for the opportunity to interact with her and ask questions about becoming an author, writing a book, and getting published. STUDENTS SELECTED FOR PMEA BAND FESTIVAL Eden Loux, Kaitlyn Good and Corbin Tenney were selected to participate in the Pennsylvania Music Educators Association District 11 Elementary Band Festival. They joined over 100 of the top music students from Bucks and Montgomery Counties to rehearse and present a concert on Friday, January 25, at Upper Perkiomen High School. Congratulations to these outstanding musicians! that uses extraordinary music education through the pursuit of music excellence to inspire a strong sense of character, discipline, commitment, and community for a diverse student population. Madelyn and Greta attend practices every Saturday in Philadelphia. TOURING CHOIR KICKS OFF SEASON The Dock Mennonite Academy Touring Choir has kicked off its 2019 season with concerts at Towamencin Mennonite Church, Fairview Village Church, Souderton Mennonite Church, and Carnegie Hall in New York City. You are invited to attend the concerts remaining on the choir’s spring schedule: Spring 2019 Touring Choir Itinerary April 12-14 Mennonite Schools Council Choral Festival, Lancaster, PA April 28 Salford Mennonite Church, 9:00 a.m. May 19 Franconia Mennonite Church, 10:15 a.m. May 22 Dock Spring Concert, 7:00 p.m. June 2 Blooming Glen Mennonite Church, 9:30 a.m. June 2 Zion Mennonite Church, 7:00 p.m. Thank you to Carolina Fraser ’19 for the photo on the cover of this year’s Touring Choir program. DOCK BUSINESS STUDENTS LEARN FROM THE PROS Textbooks, lectures, and videos are great, but when it comes to learning about business, can there be a better teacher than someone who runs a business? Students in Mr. Mike Lambright’s Intro to Business course had some golden opportunities to learn first-hand from local businesspersons who helped them understand complex topics such as commercial loans, franchising, retail, operating as a non-profit, and the legal issues involved in starting a business. “There is no limit to the information about business that students can access online or through print media,” said Mr. Lambright. “However, a live inclass discussion with a real-life business owner is the best way to expose students to the world of entrepreneurship. Hearing about the risks, rewards, challenges and passion from community business leaders enables me to inspire my students and help connect school with community.” In addition to Will Bergey (’67) of Bergey’s Electric (pictured, below), other business leaders who spoke to the class include Doug Clemens (Clemens Food Group), Dock board member Suzi Berry (Travel Haus), Michael (‘77) and Robert Bishop (Bishop’s Excavating), Henry Rosenberger (‘63, Rosenberger’s Cold Storage), Steve Hunsberger (‘87, Indian Valley Chamber of Commerce), John Duerksen (Univest), Kevin Moyer (Lansdale School of Business), Sheryl Derstine (‘78, Franconia Heritage Gift & Clothing Shop), Marty Wolfe (PrintWorks), Kyle Zehr (Franconia Insurance & Financial Services), former faculty member Bernie Wallerich (Atlanta Bread Co.), and Scott Landis (‘82, Landis Supermarket). HANDS-ON LEARNING ABOUT SOLAR Dock students now have a hands-on learning opportunity about alternative energy right in their Environmental Science classroom, thanks to a generous donation from Bergey’s Electric. Over the winter, Bergey’s installed a solar panel in Ms. Valerie Metzler’s classroom that provides real-time data so that students can learn more about solar energy as an alternative to fossil fuels and other energy sources. While Bergey’s donated the panel itself and the labor to install it, other equipment for the installation was purchased with the David Souder Endowment Fund. Souder was a member of Dock’s Class of 1963, which funded the endowment and continues to oversee its use. “We are grateful for Dale Bergey’s commitment to this project and the generosity of Bergey’s Electric,” said Dock Director of Advancement Robert Rutt. DOCK’S FIRST-EVER EXPERIENTIAL DAY Dock held its first-ever Experiential Learning Day on January 4 for grades 9, 10, and 11. Students had both half-day and full-day options for on- and off-campus learning experiences, and were able to sign up for the activity of their choice. “At Dock we realize that significant learning happens outside the traditional classroom, so we planned a day for experiential learning,” said Dr. Sharon Fransen, Assistant Superintendent of Curriculum and Instruction. “We know students learn about the world and other peoples through innovative experiences, play, and reflection. We envisioned a day where teachers would share areas of expertise or passion, and students would learn something not found in our formal programming.” Experiential learning is the process of learning through participation rather than by listening to a lecture or reading about a topic. Learning opportunities for students ranged from Spanish language immersion to tours of the National Liberty Museum and Penn Museum in Philadelphia, sustainable farming practices, shooting and editing better photographs, creative writing workshops, and many others. Dock’s first Experiential Learning Day was held the same week that seniors were off campus doing some experiential learning of their own during Senior Experience—a full week of job shadowing and/or service opportunities that help many seniors discern college and vocational interests (see Hands On, page 6). Dock administrators and faculty are currently finalizing plans to extend the Experiential Day concept to a full week in the school calendar for 2019-20. “Some schools have a ‘mini-term’ with several days of experiential learning in which activities are planned around one topic,” said Dr. Fransen. “We will try that in the future, but this year we got a taste of what that could be like for us as a school community. 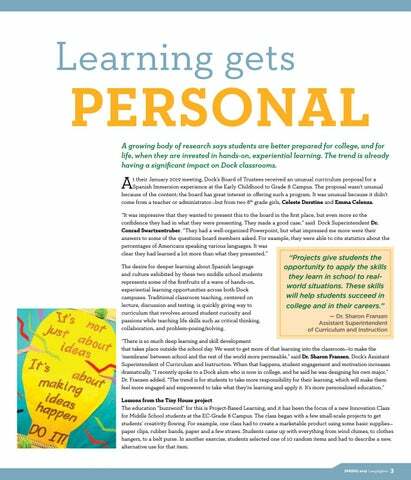 It was exciting to learn together.” Learn more about Dock’s Project-Based Learning initiative on page 2 of this issue. DOCK COOKS CROWNS 2018 WINNERS The Dock Cooks 2018 culinary competition found the perfect seasonally appropriate theme: Anything and Everything Pumpkin. Dock Cooks features teams of student chefs competing to create scrumptious (and beautiful) dishes that will win over the taste buds of faculty judges. Once again, our student chefs did not disappoint, serving up an eclectic mix of goodies that made the judges' job extremely difficult—in a good way! There were pumpkin bars, pumpkin cupcakes, pumpkin donuts, pumpkin pie (in a jar! ), pumpkin soup, pumpkin dip, pumpkin bread, pumpkin cinnamon rolls, pumpkin cake, pumpkin crisp, pumpkin tart, and even pumpkin dumplings and pumpkin fried rice. It may have been one of the most creative Dock Cooks competitions ever. In the end, the numbers yielded these results: • Winning the 3rd place ribbon for their delightful Pumpkin Donuts with Salted Carmel Glaze were Regan Zehr and Makenna Rodriguez (above, center). • The 2nd place ribbon went to Peter Liang and Leo He (left) for their innovative Pumpkin Soup and Deep Fried Pumpkin Dumplings. • The 2018 winners of the Dock Cooks competition, for their sensational No Bake Pumpkin Pie in a Jar—as pretty to look at as it was delicious to eat—were seniors Macy Balmer and Laura Bergey (right). Congratulations to ALL of our student chefs for their hard work and creativity. You helped make Dock Cooks 2018 a competition to remember! DOCK PLAYS INSTRUMENTAL FESTIVAL Dock’s Concert Band and Orchestra combined their talents with those of musicians from Eastern Mennonite High School at the Mennonite Schools Council Instrumental Festival Feb. 28-March 1 in Harrisonburg, VA. which culminated in a concert on Friday evening. The orchestra practiced and performed under the direction of Guest Conductor Don Brubaker, while the Band was directed by Richard Adams. Dock will host the Instrumental Festival next year. Also, congratulations to senior Ryan Kratz, who was selected to both District and Regional Choirs this year! DOCK SENDS TEAM TO ACADEMIC COMPETITION Six Dock students participated in the 2019 Montgomery County Academic Competition on March 5 in Norristown. Sponsored by the Montgomery County Intermediate Unit, the competition featured 19 teams, with the top team going on to compete at the state level. The competition consisted of two matches, in which Dock competed against two other teams for points. Each match had two rounds, and a round had two parts: 10 “toss-up” Jeopardy-style questions, and a “Fanfare” round in which each team had the opportunity to answer up to six questions in 60 seconds. Congratulations to Dock team members (left, l to r) Ming Xue, Tyler Rotelle, Alexa Kennel, Ashley Mellinger, Jie Ji, and Claudia Zhang. The new leadership team at Pinebrook Christian Retreat Center includes (l to r) Darren Gehman, Finance Manager; Chad Strausbaugh (Site Director), Abby Strausbaugh (Front Desk Manager), and Facilities Manager AJ Longacre (’09), with wife Hailee and children Daphne and Joel. ALUMNI NOTES 1967 Martha (Whitermore) Dillon, of Lancaster, died on February 19, 2019, at Paramount Senior Living in Maytown. She was 68. Born July 24, 1950, in Alberta, Canada, “Marty” was the daughter of the late Pastor David Whitermore, and Marion (Yost) Whitermore. She and her family were members of Grace Mennonite Church in Lansdale, where her father had served as pastor. Marty graduated from Messiah College and then earned her Master's Degree in psychology from the University of Hartford. Marty worked for 10 years with the Veterans Administration in New Haven, CT, undertaking clinical research on Post Traumatic Stress Disorder (PTSD). She then taught psychology for 20 years at Central Connecticut State University, Shippensburg State University, and Montgomery County Community College. Martha is survived by her husband of 45 years, Michael Dillon, her daughter, Elizabeth Cunningham, her mother, Marion Whitermore, brothers David Whitermore (’72) and Mark Whitermore, and many nephews and nieces. 2003 Ashley Moyer, one of Dock’s 2018 Alumni of the Year, graduated in December 2018 from Temple University’s School of Public Health with a Doctorate of Nursing Practice. She is currently a critical care nurse at Fox Chase Cancer Center. 2005 Isaac Shelly continues to serve as Treasury Manager for Rosetta Stone in Harrisonburg, VA. In May 2019 he will complete his MBA at James Madison University. As part of his graduate program, he and his wife Rebecca spent time in Vietnam and Thailand, giving Isaac the opportunity to study culture and emerging markets. 2009 A.J. Longacre (top) is the Facilities Manager at Pinebrook Christian Retreat Center in the Pocono Mountains near Stroudsburg. AJ will oversee improvements of the buildings and grounds at Pinebrook, which has been under the stewardship of Spruce Lake since October 2018. Maddison Landis and her Messiah College teammates capped an amazing indoor track season by shattering the distance medley relay record at the Tufts National Qualifying Meet at Tufts University. Maddison and three teammates ran an 11:53:61 in the relay, breaking the previous record by nearly 17 seconds. 2017 Amber Clemens had her paper, entitled Children’s Educational Television: Equipment for Living in Mister Rogers’ Neighborhood, accepted to the Eastern Communication Association's Undergraduate Scholars Research Conference. Amber will present her paper at the conference in Providence, RI, in April. She is a sophomore communications major at Messiah College. Brian Miller graduated from Universal Technical Institute in February 2019 with an associate’s degree in diesel and industrial technology. Upon graduation, he immediately began a 15-week Peterbilt certification. Send us your News www.dock.org/alumni/send-us-your-news Did you just get married? — Have a new baby? — New job? New degree? — Did you recently receive an award or recognition? We'd love to share your news! Join us in celebrating Dock’s winter athletic teams and student athletes! 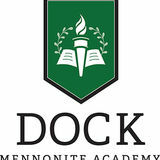 WWW.DOCK.ORG Dock Mennonite Academy inspires and equips each student to serve with a global perspective by integrating faith, academic excellence and life-enriching opportunities in a Christ-centered community. Dock students are benefitting from the first wave of experiential, hands-on learning opportunities being introduced into the Dock curriculum. The changes are replacing traditional classroom teaching with project-based learning that teaches 21st century skills such as critical thinking, problem-solving, collaboration and communication.